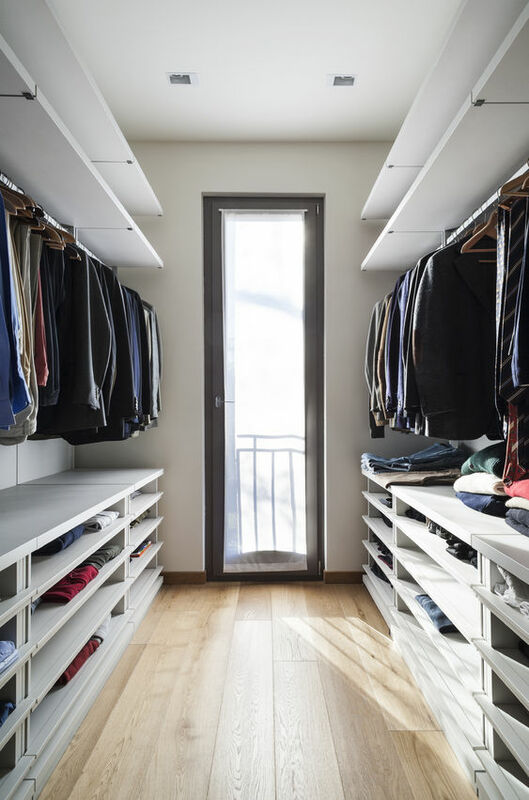 From professionally customized storage systems to do-it-yourself options, improving your closet space can be key for an easier, more organized lifestyle, whether you’re planning to hire a remodeling contractor or simply upgrading your storage space. But what kind of improvements do you want to make? With so many choices spanning a wide variety of budget options, here are some tips for closet design. No matter what the size of your closet, organizers can help you neatly accommodate clothing and accessories. Economical and offering good air circulation, lightweight wire rack systems are one way to go, keeping clothing items visible. For smaller, loose items, use baskets or bins. Wood or wood-grained particle board shelves are another good, sturdy, moderately priced system for storage. Sliding closet baskets are an excellent choice if you have the room to mount them. They’re especially useful for storing folded clothes and accessory items like gloves and socks. For shoes, a shoe cabinet, shoe racks, hanging shoe bags, or shoe cubicles serve a similar organizing purpose. Another way to enhance closet space: closet towers. Either free-standing or bolted to a wall, they’re a combination of shelves and cabinets that provide more vertical storage space. If these space-saving options don’t do the trick, and you have an underused spare bedroom, you could create the ultimate walk-in closet. Cover windows with shades, blinds, or shutters; install low-heat overhead lighting; add rods, shelves, and even a dresser. You’ll have plenty of room to include seating and a mirror, too. All the closet organization and space-saving in the world won’t help if you can’t find what you’re looking for when you open the closet door. Closet lights triggered by a motion sensor that automatically switch on and off are convenient energy-savers. Any light source should be positioned between you and what’s inside the closet to prevent casting dark shadows on what you’re storing. Small LED lights can make be used to spotlight accessories or shoes. Remember, compact fluorescent bulbs generate less heat, use less energy, and are safer than their halogen counterparts. When revamping closet space, it’s important to make sure you can easily access it. Make sure you have the right amount of clearance to allow easy door opening. Be sure and take precise measurements for doors as well as closet depth and width to accommodate storage systems. Whether you want to make sure everything you need to get dressed in the morning is all in one place, or you want to create easy-to-access storage racks for your shoe collection, be sure that you’re matching your closet’s organizational look to your own personal habits and style. Want a laundry hamper in your closet? Would a mirror simplify your morning ritual? Would you prefer accessories such as scarves be folded or hanging from accessory hooks? These are the types of ideas to consider as you design or improve your closet space. Are you in the planning stages of a home remodeling project? Using Contractor Connection can make it simpler from start to finish. Because we pre-qualify every professional general contractor in our network, you know you’ll be working with someone you can trust. Get your free, no-obligation estimate from a pro in your area today. Just enter your ZIP code at the top of the page to get started!